Allahabad University Admission 2019: The admission to one of the prestigious university established in the state of Uttar Pradesh is provided on the basis of the entrance exam conducted by the University itself. The Application Form to apply for UGAT 2019 is available from 12th April 2019 and the last date to submit the form is 3rd May 2019. Allahabad University every year invites Applications for the admission to Under Graduate courses offered by the competent faculty and conducts Under Graduate Admission Test (UGAT). The candidates interested in taking admission for 2019 session to the UG courses offered by the University are required to fill up the Application Form and submit it before the due date. The Applications received after are not accepted. The Forms are available in an online mode only and candidates have to enter the details in the form very carefully. The University also offers PG courses. For more of the details regarding Allahabad University Admission 2019 go through the article below. New: The online Application Form to apply for Allahabad University UGAT 2019 is released on 12th April 2019. The last date for the form submission and the payment of the fee is 3rd May 2019. Fill Allahabad University Application Form 2019 here. Allahabad University releases the schedule making the announcement of the important dates regarding the admissions to Undergraduate courses. Candidates planning on taking admission to the University must keep themselves updated with the latest released information on the website. Go through the schedule of Allahabad University admission 2019 of Undergraduate courses from the tabular format below. * There shall be no separate test for this course. Applicants for this course will appear in UGAT for B.A. Course. Allahabad University has released the Application Form for the session 2019 for the admission to Undergraduate courses on its official website as per on the scheduled date which will be released by the University next year. Candidates planning on taking an admission to the course have to visit the website regularly so that any of the important event is not missed. The Forms of the University are released by the examination conducting body in an online mode and there is no other way of accessing the forms. The submission of the Allahabad University Application form will be an important step in order to proceed for the admission procedure further. Candidates who are able to successfully fill up the Application form are eligible to appear for Allahabad University entrance exam 2019 in order to acquire a seat in their preferred course. The details mentioned in the Application form should be valid and correct as any form of misleading detail will lead to the cancellation of the candidature. Candidates must provide the Personal Details, Academic Details, Contact Details and uploading of scanned documents along with the Application Form. After the Registration, the candidate will be provided with an Application number and password. It should be noted that the final submission of the form will only be after the payment of the Application Fee. Allahabad University will be releasing the Information brochure along with the Application Form which will be made available by the University. It is important that the candidate make themselves aware with the eligibility criteria which will be defined as per the course applied by the candidate. The eligibility criteria for the Undergraduate course and Post Graduate courses will differ depending on the candidate’s capability. The eligibility conditions are the basic criteria which the candidate has to fulfil. For Undergraduate courses, the applicant not fulfilling the eligibility will not be allowed to appear for the exam. The candidates are advised to go through the eligibility very clearly before proceeding to fill up the Application Form. Candidates applying for the Undergraduate Programs must have passed their Intermediate exam or an equivalent examination from the recognized board or University. The candidates applying for the Science stream courses such as B.Sc. must have Physics, Chemistry and Mathematics in their class 12th. The candidates from other streams will not be allowed to apply for the science courses offered by the University. The Applicants planning on applying for B.Com course must have commerce in their class 12th. B.Sc. Home Science course which is offered by the University is only available for the female applicants. Candidates applying for the music courses must have Music as one of their subjects in class 12th or must have passed an equivalent examination in Music from a recognized University. The Admit card of Allahabad University will be made available on the official website of Allahabad University. It is a mandatory document which will be required to be presented on the day of the exam. The Admit Card of Undergraduate courses will be available to download only by those candidates who have filled up the Application Form and successfully submitted the Application Fee. Allahabad University Admit Card 2019 will mention all the important details such as the name of the candidate, venue of the entrance exam, date and timing of the examination, course name, course code, Application number and other important instructions to be followed by the candidate on the day of the exam. The availability of Allahabad University Admit card will only be in an online mode and candidates will have to provide the Login details in order to access the Admit Card successfully. It is very important to note that the details mentioned on Allahabad University Admit Card 2019 are valid and correct as the entry will be on the basis of the information on the document. In case of any incorrect information or any form of discrepancy in the Admit Card, candidates will have to contact the examination conducting body immediately. Candidates planning on appearing for the Under Graduate Admission Test (UGAT) will be required to make themselves familiar with the examination pattern of the entrance exam. The pattern will be set by the examination body of the University which will also make the pattern of the question paper available on its official website. Being known to the form of the questions which will be asked in the question paper will make it easier for the candidates to prepare for the exam. It should be noted that the candidate should be preparing for the exam for which they are planning in appearing. The Pattern of Allahabad University UGAT question paper will be of the objective type. Each question will consist of the option of four possible answers out of which the candidate has to mark the correct one as per their knowledge and understanding. There will be 150 multiple choice questions. Candidate will have to attempt all the questions as there will be no choice. There will be Negative Marking. For every incorrect answer o.5 marks will be deducted and for every correct answer, 2 marks will be awarded to the candidate. Allahabad University will be releasing the Result after the successful conduction of the entrance exam conducted by the University. Candidates who gave the entrance test will be eligible to go through the result which will be available on the official website of the University. In order to proceed for the Admission Procedure further regarding the course for which the candidate applied for, it will be important that the candidate must have qualified the entrance exam. 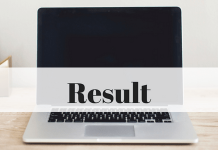 The Result PDF released by Allahabad University will mention the name of the candidate, Roll Number, Application Number, Maximum marks of the exam, Marks Secured by the candidate and important instructions to be followed by the candidate after the declaration of the result. It should be noted by the candidate who appeared for the entrance exam that the Universiy will also be releasing the Cut off marks and the final admission will be provided through the Counselling Procedure and Seat Allotment which will also be held by the University as per on the scheduled date. The University will be releasing the cut off list on its official website as per on the prescribed date. The candidates who appeared for the exam and whose names will be mentioned in the Result list will be able to go through the cut off marks and check whether they have been able to score the minimum of the marks mentioned in the cut off list in order to pass the exam. The cut-off marks list will have the minimum number of marks which has to be secured by the candidate in order to pass the exam. The preparation of the cut off list marks is based on the basis of the minimum of the marks secured by the candidates in aggregate in the exam. The number of the candidates applying and the availability of the seats for the course applied by the candidate will also be taken into consideration for the preparation of Allahabad University Cut Off List 2019. The University conducts the Counselling Procedure after the declaration of the result and the release of the cut-off list marks on its official website. It is an important step which is conducted for the seat allotment to be held by the University for granting the admission to the candidate in the applied course. The Final Seat Allotment is held through the counselling and the candidates who successfully qualified the entrance exam will be called for the Counselling procedure. In order to appear for the Counselling, it is important that the candidate has passed the entrance exam and have secured equal or more marks as mentioned in the Cut Off List. The candidates who have qualified the exam will be provided with the Seat Allotment Letter which will mention the details regarding the Counselling, the place and timing at which the candidate has to appear in order to attend the counselling procedure. It is important that the candidate appears for the counselling, in case the candidate fails to appear for the counselling at the allotted centre, her/his seat will be allotted to the candidate next in the waiting. The list of the documents to be produced at the time of the counselling will be mentioned in the Information Brochure. Candidate should be physically present on the day of the counselling with the documents in original along with the self-attested photocopies. The submission of the Admission Fee will be on the same day as per on the day of the Seat Allotment Procedure.